But, he added, in the "exceptional situation" where the EP applicants have skillsets needed in Singapore but are unable to meet the criteria, "we do allow sector agencies to exercise some flexibility, but only in a highly selective manner". The Employment Act will widen its reach to ensure that higher-paid workers, including all professionals, managers and executives (PMEs), will be entitled to em-ployment terms such as paid sick leave and compensation for wrongful dismissals. These rights, spelt out in the core provisions of the Employment Act, Singapore's primary labour law, currently apply only to the 290,000 PMEs who earn up to $4,500 a month and non-PMEs. But the salary cap will be removed, in a move that would benefit an additional 430,000 PMEs. Manpower Minister Lim Swee Say announced the move yesterday during the debate on his ministry's budget, at which labour MP Patrick Tay (West Coast GRC) and Dr Intan Azura Mokhtar (Ang Mo Kio GRC) had asked about a review of the Employment Act. The changes to the Act will be implemented by April 1 next year. Mr Lim said this move would extend legal protection to all workers, except for public servants, domestic workers and seafarers, who are covered separately, such as by other legal provisions, due to their nature of work. This follows a public consultation on the proposed changes, which wrapped up last month. Mr Tay told The Straits Times that each month, he sees about five to 10 PMEs earning more than $4,500 approaching him and the National Trades Union Congress for help with workplace grievances. These were mainly for unfair dismissals. "I suspect there are more cases," he said. As they are not covered under the Act, their only recourse is a civil suit or voluntary mediation if they cannot resolve the issue with the employer or through a union. But many of the companies they work in are not unionised, he added. The Tripartite Alliance for Dispute Management, which conducts voluntary mediation for such PMEs, saw more than 400 PMEs earning more than $4,500 who sought its assistance for salary claims between April and December last year. With the proposed changes, this group could appeal to the Manpower Minister to have their jobs back, or claim compensation. Mr Lim said more rank-and-file workers, such as clerks and retail assistants, will also receive additional protection. Under the changes, employees earning up to $2,600 will be eligible for overtime pay, up from the previous cap of $2,500. The Ministry of Manpower (MOM) will also improve how employment disputes are settled. Though dismissal claims and salary issues often go together, workers have to refer salary-related disputes to the Employment Claims Tribunals (ECT), while wrongful dismissal claims go before MOM. But after changes to the Act have been made, workers can go to the ECT to address both issues. Mr Ian Lim, a partner who heads the employment and labour practice at TSMP Law Corporation, welcomed the "bold and inclusive" changes announced by the MOM. However, he said that it is important to be very clear on what constitutes a wrongful or unfair dismissal. "The last thing we want is to inadvertently go to the other extreme and become one of those places where it is virtually impossible to fire even a highly insubordinate or severely underperforming employee without paying hefty compensation," he added. A total of 500 companies have been put on a government watchlist over the past two years for unfairly favouring foreigners in their hiring. Such "triple weak" companies - which hire a high proportion of foreigners, have no plans to recruit more Singaporeans and contribute little to the economy - have their Employment Pass (EP) applications scrutinised more closely. Since February 2016, 1,900 EP applications have either been rejected or withheld by the ministry, or withdrawn by the companies, Manpower Minister Lim Swee Say said during the debate on his ministry's budget yesterday. The companies on the watchlist are from various sectors and include headhunters, he said. 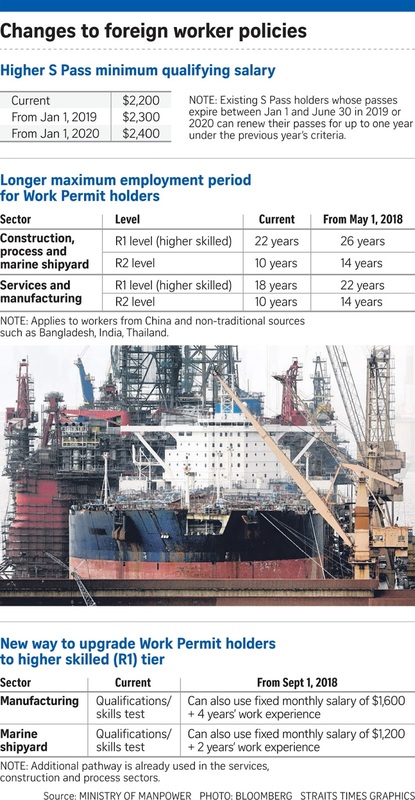 "They have the pre-conceived idea that local PMETs are either unable or unwilling to do the job, so they write them off without even considering them fairly," he said, in reference to professionals, managers, executives and technicians. Mr Lim was responding to MPs Patrick Tay (West Coast GRC), Jessica Tan (East Coast GRC) and Lim Biow Chuan (Mountbatten) who asked for an update on the list. Mr Lim said organisations such as the Tripartite Alliance for Fair and Progressive Employment Practices (Tafep) and the institutes of higher learning have since worked with some of the blacklisted companies to improve their human resource practices and hire fresh graduates and mid-career local PMETs. So far, more than 2,200 Singaporeans have been hired and 150 companies have exited the watchlist. For example, an information technology services firm with more than 1,000 PMET employees was placed on the watchlist in February 2016. But after working with Tafep and the Infocomm Media Development Authority, it hired about 200 more Singaporeans and has since been removed from the list. Today, it continues to adopt fairer and more progressive human resource practices, said Mr Lim. A wealth management firm with 80 PMETs was also placed on the watchlist two years ago as it used to hire mostly foreigners to serve its clients, who were mostly expatriates. Since then, it has started serving more local clients and hired 30 Singaporean PMETs, and trained them in Singapore and overseas. This, noted Mr Lim, was a "win-win outcome". But of the remaining 350 companies on the list, 60 have not been cooperative and showed no sign of improvement. "We have curtailed their work pass privileges," said Mr Lim. This means that they have had no new EP applications approved and no renewal of existing EPs. When asked, the Manpower Ministry declined to give more details of the firms on the watchlist, including the common industries they are in. Payment disputes are a major concern for the self-employed, but it is impractical to mandate written contracts for all freelancers and gig workers, Second Minister for Manpower Josephine Teo said in Parliament yesterday. A set of guidelines on best practices for engaging freelance services has been launched instead, to help reduce such disputes. Buyers who adopt the new Tripartite Standard on Contracting with Self-Employed Persons would need to discuss and agree with the freelancer the terms of engagement, such as the range of services to be delivered, project timelines and milestones, and payment schedules. "Over time, the standard will help shape contracting norms and entrench best practices," Mrs Teo said during the debate on the Ministry of Manpower's (MOM) budget. The Tripartite Alliance for Dispute Management will also extend voluntary mediation services to all self-employed workers who have payment disputes with businesses. The standard was one of several recommendations made by a tripartite workgroup looking into the concerns of the self-employed, which the Government is taking up. Those who make their income primarily through self-employment now make up 8.4 per cent of the resident workforce. The tripartite workgroup also recommended that a prolonged medical leave (PML) insurance product be developed to mitigate a self-employed person's loss of income during prolonged injury or illness. Today, some self-employed workers buy additional riders on top of their private insurance plans to provide for this, but there is a lack of an affordable standalone PML product, she said. NTUC Income is keen to develop such a product, Mrs Teo said, adding that the aim is to have a viable plan and for a PML insurance product to be available next year. The Government will also encourage the widespread adoption of insurance in some higher-risk occupations, starting with sports coaches and instructors, as well as taxi and private-hire car drivers. Together, these two groups make up 30 per cent of all self-employed people here, Mrs Teo said. The Ministry of Education has agreed in-principle to contract only with self-employed coaches and instructors who have such PML insurance coverage, she said. These freelancers may then price the cost of PML insurance coverage into their bids for work or projects. MOM and the Land Transport Authority will study how to ensure that active taxi and private hire-car drivers also have PML insurance coverage, she added. Mrs Teo also noted that about one in four self-employed people fails to keep up with his Medisave contributions. To help this group save enough for their healthcare and retirement needs, the Government is studying how to implement a "contribute-as-you-earn" (CAYE) model, under which the service buyer hiring the freelancer has to make a contribution to the person's Medisave account, as and when the service fee is paid. This is similar to how employers make a contribution to their workers' Central Provident Fund accounts alongside their salaries every month, Mrs Teo said. MPs of both genders addressed issues related to women in employment yesterday, offering a slew of suggestions - some of which the Government has promised to study further. During the debate on the Manpower Ministry's budget, sexual harassment and the gender pay gap were raised by several MPs, drawing front-bench explanations that shed important light on these issues. Harassment has been an explosive topic globally, with the #MeToo movement exposing many men in positions of power and triggering deep reflection across Western societies. In Singapore, the problem has not reached similar proportions. An annual average of 20 police reports involving sexual harassment or insult of modesty in the workplace were filed from 2013 to last year, revealed Second Manpower Minister Josephine Teo. But, as Mr Louis Ng (Nee Soon GRC) noted, it may be growing: A sexual assault care centre run by the Association of Women for Action and Research, the gender equality advocacy group, has seen workplace-related reports rise from 66 in 2015 to 108 last year. MPs called on the authorities to facilitate mediation, and for existing labour bodies to be given more teeth on harassment. Nominated MP K. Thanaletchimi arguably went furthest, pushing for workplace harassment to be treated on a par with workplace injury - and for reports by employers to the authorities to be made mandatory. Knowing the numbers will give a better understanding of the scale of the problem, and the type of intervention needed, she said. In responding to MPs, Mrs Teo outlined the avenues open to victims. These have widened since the Protection from Harassment Act was passed in 2014 and include approaching her ministry and the Tripartite Alliance for Fair and Progressive Employment Practices (Tafep), seeking civil remedies in the courts, and making a police report. But she turned down the call for mandatory reporting, noting that "some employees prefer to resolve the matter privately without involving the authorities, (and) would rather report the matter to their employers". "Legislating mandatory reporting by employers... will close off this avenue for such employees and discourage them from raising the matter with anyone. This is not helpful to them," she added. This is a sensitive matter for affected employees that perhaps deserves further discussion at Tafep or other relevant forums. Mandatory reporting does have its benefits. In the case of workplace injuries, it prevents cover-ups and compels employers to take each incident seriously. Harassment is not totally analogous to injury, but there is scope to explore how employers can be made to give due regard to each case. On the gender pay gap, Mrs Teo noted that the problem has become less serious, with the gap between men and women in full-time employment falling from 20 per cent a decade ago to 11.8 per cent last year. The gap in CPF contributions is also closing. The 11.8 per cent gap is due to women leaving work at various points in their career to take up caregiving responsibilities, and having to "catch up" with men when they return, she said. Indeed, she said she looked at public service numbers and there does not appear to be a gap there. The Government will continue to tackle the issue by encouraging women to stay in work and by promoting flexible arrangements, she said, before announcing that $30 million will be set aside to help employers implement flexible work practices. Mr Ng asked if the Government would sign the International Labour Organisation's (ILO) Convention on Maternity Protection, which guarantees a woman's right to return to the same position or an equivalent position paid at the same rate, at the end of maternity leave. Employers here currently have to pay employees during maternity leave. But it is still possible for a worker to be dismissed after maternity leave. Mrs Teo said it was difficult to sign the ILO convention because to sign it, a country has to accept every clause - even if a clause were in conflict with other other existing treaties and agreements. "But let me assure the member that the laws in Singapore already provide adequate protection to women who become pregnant and when they are on maternity leave," she said. But the issue of whether employees should also have the assurance that they cannot be dismissed once their maternity leave ends merits more study by tripartite partners, as such a move will better protect new mothers. Of course, any such measure has to be weighed carefully so it does not inadvertently make it harder for women of child-bearing age to find employment in the first place. Yesterday's debatehighlighted the fact that despite significant progress, there are women who continue to be vulnerable in the workplace. And the challenges they face are complex. Some are torn between equally difficult options: in the case of harassment, whether to report it or not; or on the issue of a pay gap, whether to continue working or be a caregiver. It must be recognised that they face such dilemmas through no fault of their own. Government, employers and unions must continue to deliberate over such tensions, with a view to relieving them where possible. Standing in front of a whirring machine, application engineer Chui Kher Ning, 27, watches it execute her commands to cut out an aluminium mould for a drone part. The high speed computerised numerical control milling machine is about 50 per cent faster than machines she has worked with, and can cut more complicated shapes. "The new machines are fun to use and they're different from what I used in school and at my previous job," said Ms Chui, who works at local precision engineering machine supplier Ichi Seiki. 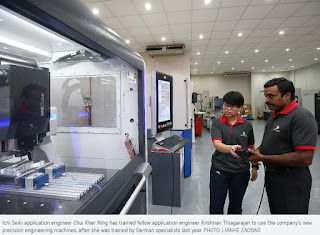 In-depth training for Ms Chui and her colleagues to learn to use the new machines would have been too costly for a small business like Ichi Seiki, which employs 30 staff. But in October, through the Manpower Ministry's Capability Transfer Programme (CTP), it brought in two trainers from Germany to run a three-week intensive course for 11 engineers. The trainers also provide remote support over a 15-month period. Mr Philip Kia, Ichi Seiki's managing director, said the programme has allowed his firm to provide more thorough training for staff. His engineers now also train staff at local firms to use the new machines. The CTP, which has been running as a pilot scheme since last October, helps companies bring in foreign specialists to train workers in areas where local expertise is lacking. It supports 30 per cent to 70 per cent of the training costs - including salaries of expert trainers, living allowance and training equipment - capped at $300,000 per project. Other industries using the scheme include pharmaceutical transportation and lift maintenance, said Manpower Minister Lim Swee Say yesterday. Overseas specialists will teach lift technicians here how to use data analytics in preventive and predictive lift maintenance. Local trainers will also be sent overseas. Mr Lim also said the ministry can consider funding support of up to 90 per cent, and extending the cap, in exceptional cases where training costs are high and it is crucial to build local expertise. Mr Low Thia Khiang (Aljunied GRC) asked how outcomes will be measured to ensure the money is well spent. To this, Mr Lim said the ministry will consult sector agencies and industry transformation maps when evaluating the outcomes of projects. The Government's move to lower the costs of investing retirement funds under the CPF Investment Scheme (CPFIS) will help improve investment returns and counter the undesirable practice of churning, said financial experts yesterday. Churning involves buying and selling products at the expense of the investor merely to generate commissions for financial advisers. The cuts to the sales charge and wrap fee under the CPFIS will be done in two phases, the first starting on Oct 1. 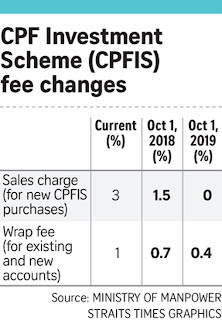 Sales charges for new purchases of CPFIS products, such as investment-linked insurance policies (ILPs) and unit trusts, will fall from 3 per cent to 1.5 per cent. This charge will be removed entirely from Oct 1 next year. A Manpower Ministry spokesman said the sales charge incentivises financial advisers to sell products to earn more commission. CPFIS investors are already able to buy unit trusts via online platforms without incurring any sales charge. Mr David Gerald, president of the Securities Investors Association (Singapore) or Sias, welcomes the move as fees are a "drag on investment return". Mr Sam Phoen, co-founder of Wateram Capital, said: "The eventual removal of the sales charge ensures every dollar invested goes straight into the fund and earns a return." 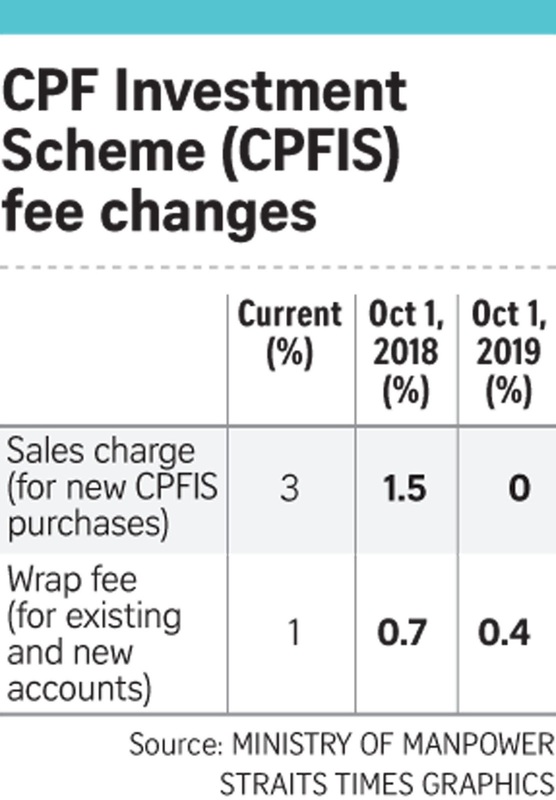 The Life Insurance Association Singapore added that the fee cut and its eventual removal may result in a dip in the volume of transactions for CPFIS-included policies as ILPs in the scheme generate up to 3 per cent sales charge for financial firms. "Individual life insurers can be expected to assess ... their continued participation in the CPFIS," it said. "For instance, life insurers could market CPFIS-included products online without financial advice to cater to knowledgeable self-directed consumers." Financial advisers can charge a wrap fee of up to 1 per cent of assets under management a year for CPFIS members with wrap accounts. This wrap fee covers both advisory services and the costs to maintain the wrap account. The cap on annual wrap fees will be lowered to 0.7 per cent on Oct 1, and to 0.4 per cent on Oct 1 next year. The Manpower Ministry said the 0.4 per cent cap is similar to fees charged by online investment platforms in the cash market. Providend chief executive Christopher Tan said that while removing the sales charge will help counter churning, the side effect is that advisers may not earn enough when giving investment advice. That could induce them to sell insurance products like endowment plans instead of low-cost unit trusts under the CPFIS, which may not be in the best interests of consumers. He suggests capping the sales charge to say 1 per cent instead of removing it completely, and lowering the total expense ratio (TER) instead of lowering the wrap fee. The TER comprises management fees and additional expenses, such as trading, legal and auditor fees as well as other operational costs. The more actively managed the fund, the higher the TER. "By lowering wrap fees and not TER, you penalise good advisers who recommend low TER funds, which are better for the consumers, but reward advisers who recommend high TER unit trusts, which are bad for consumers," said Mr Tan. He suggests that the TER of funds under the CPFIS be capped at a "more reasonable" amount like below 1 per cent a year. The current cap of 1.75 per cent is "too high and eats into returns", he added. A new self-awareness questionnaire will also be introduced as part of the process of opening a CPFIS account from Oct 1. Another 10,000 students will be eligible for financial help from the Government, bringing the total number to around 90,000, with the Ministry of Education (MOE) relaxing its qualifying criteria. Minister for Education (Schools) Ng Chee Meng announced in Parliament yesterday that the gross household monthly income cap will be raised from $2,500 to $2,750, and the per capita income ceiling will go up from $625 to $690. The bursary for junior college and pre-university students who need financial aid will go up from $750 to $900. Secondary school students under the School Meals Programme will also be given 10 meals each school week, up from the current seven, said Mr Ng. More middle-income families will also get higher fee subsidies when the income criteria for the Independent School Bursary is revised from next month. These initiatives will cost the Government close to $100 million a year. Several MPs - Dr Lim Wee Kiak (Sembawang GRC), Ms Cheng Li Hui (Tampines GRC) and Mr Edwin Tong (Marine Parade GRC) - had asked about financial support for students in schools. In response, Mr Ng said education in Singapore is heavily subsidised at all levels, and MOE is "committed to providing quality and affordable education to all Singapore citizens regardless of their financial circumstances". Primary school pupils will also receive $230 - $30 more - in their Edusave accounts from next January, with secondary school students getting $50 more, bringing the sum to $290. "With this increase, students can participate in more activities, such as creative writing programmes and learning journeys, to broaden their learning experiences," said Mr Ng. In response to Ms Sylvia Lim (Aljunied GRC), Senior Minister of State for Education Janil Puthucheary said MOE tracks the progress of all students, especially those from disadvantaged backgrounds, "very closely". Ms Lim had asked how the Government measures social mobility, noting that other countries like Britain have developed a "dashboard" of social mobility indicators based on the life cycle of a person. "The objective is to make life chances more equal at the critical points for social mobility," she said. These can range from early childhood development to getting into the labour market. Dr Janil revealed that nine in 10 students from the bottom 20 per cent of socio-economic backgrounds progress to post-secondary education. More than half of students who live in one-to three-room flats move on to publicly funded degree or diploma programmes, he said. At the age of 17, students may still be discovering where their passions lie and may not be ready to decide, for instance, between software programming or cyber security. This is why a scheme that lets engineering students at polytechnics sample foundation courses before deciding on their specialisation will be expanded to cover students in other faculties. The Common Entry Programme, as the scheme is called, will be offered to students taking business and information and digital technology courses from next year. The scheme aims to give students more time to discover where their strengths lie before selecting an appropriate programme. A student in the information and digital technologies cluster, for example, will take foundation courses in computing mathematics, introduction to programming and networking fundamentals in his first year. In his second year, he can then decide to specialise in network engineering, software programming or cyber security. Education Minister (Higher Education and Skills) Ong Ye Kung, who announced the change, said it is important that schools, post-secondary institutions and universities help students discover their innate strengths and talents. This is the way to ensure that Singaporeans keep learning and upgrading themselves. "Only an interest-driven choice will motivate students to want to learn their whole life, to master their professions and their craft, and to build expertise in their fields," he said. He agreed with Mr Seah Kian Peng (Marine Parade GRC) that currently, most polytechnic students get funnelled into occupation-specific courses right from the start. "It is daunting and confusing for our young students, who, at age 16 or 17, have to choose from among 230 courses. Most of them hardly know what work life is like, much less the work nature of these specific jobs." Mr Ong also noted that polytechnic courses have proliferated "as employers wanted graduates with specialised skills and wanted them fast". The courses will be streamlined and the number reduced by 20 per cent over the next few years as "over-specificity" puts students at greater risk of being displaced when the industry changes. Mr Ong also announced the expansion of another polytechnic pathway - the Polytechnic Foundation Programme open to Normal (Academic) students who have done well in N-level exams and allows them to skip Secondary 5. They go on to the polytechnics to do a one-year preparatory course that covers English, mathematics and domain-specific modules such as life sciences or physics. More than 35 per cent of the first cohort of 800 students who entered the Polytechnic Foundation Programme in 2013 scored a grade point average of 3.5 and above, compared with the norm of 25 per cent of each polytechnic cohort. As a result, the Education Ministry will expand the programme by relaxing the eligibility requirement. With this change, the top 15 per cent of Secondary 4 Normal (Academic) students - about 1,500, compared with 1,200 now - will be able to take up the foundation programme next year. But Mr Ong stressed that such changes need to be supplemented with a stronger and more systemic effort to guide students to discover where their strengths lie. Post-secondary institutions and universities, too, have had to tweak their admission criteria to take into account aptitude and interests, something that the Institute of Technical Education (ITE), polytechnics and universities have already started doing. Last year, the Ministry of Education expanded the aptitude-based admission target for universities and polytechnics to 15 per cent. Mr Ong said there is scope to do more at the ITE as admission to vocational training pathways should predominantly be aptitude-based. He also addressed concerns raised by several MPs, including Ms Denise Phua (Jalan Besar GRC), who asked what more could be done to position students strongly for the future. He said that in the past, institutes of higher learning (IHLs) had the mindset that they had three to four years to prepare students before they embarked on their careers. "So, from the word 'go', IHLs are in a race against time... The result is a hectic and technically intensive curriculum," he said. "Employers often comment that Singapore graduates know a lot of 'stuff'... but they can do better in terms of soft skills, be genuinely interested in their chosen careers and have fire in their bellies." But with learning becoming lifelong, IHLs realise that they have 20 or 30 years to work with students when they return for more knowledge and skills after graduation, and there is no hurry to pack the curriculum, said Mr Ong. "In this system, you learn to learn, and never really graduate. That is the essence of SkillsFuture, and the most important feature we need to build into our system to help us stay resilient in the face of an ever-changing future." Completing a three-to four-year university degree will no longer mark the end of studying, as training and upgrading of skills become more important in a rapidly evolving economy. Going forward, the universities and other higher learning institutes will play an even greater role in adult education, providing greater support for their alumni, said Mr Ong Ye Kung, Minister for Education (Higher Education and Skills) during the debate on his ministry's budget yesterday. For a start, the National University of Singapore (NUS) will draw up plans for each student's career and learning path, for up to 20 years from the time he is admitted, Mr Ong added. The programme, called NUS Lifelong Learners or L³ for short, will make all of the university's 288,600 alumni eligible for publicly available continuing education and training (CET) courses. They may also take selected courses, which could culminate in qualifications such as graduate diplomas, or even bachelor's or master's degrees. NUS provost Ho Teck Hua, calling the initiative a bold one and the first of its kind in Singapore, said: "At NUS, we see lifelong learning as the key to ensuring that our students and alumni stay updated on the developments and disruptions that globalisation and digital technologies are bringing to the workplace.... It represents our strong commitment to our students and alumni, as well as our ambition to be their anchor for lifelong learning." Response to the initiative, which started last year, was overwhelming, said Mr Ong. NUS received more than 8,000 applications for the first batch of 404 places in 79 courses. Said Mr Ong: "NUS will treat every student enrolment as lasting for 20 years, and not just three or four years. "It will help its students build their careers and learn for life throughout this period. This gives new meaning to the word alumni." Instead of just extracting short courses from full-time programmes, in future, the modular courses will have to be developed independently, said Mr Ong. These courses need to be delivered by industry practitioners with relevant skills, or cover cutting-edge technology that could disrupt industries, he added. He said that by 2020, the Ministry of Education expects to channel $100 million more into the CET courses run by institutes of higher learning, up from about $210 million currently. In reply to several MPs, including Ms Foo Mee Har (West Coast GRC) and Dr Intan Azura Mokhtar (Ang Mo Kio GRC), who had asked about the progress of SkillsFuture initiatives, he said that 800 bite-size modular courses have been launched since October last year as part of the SkillsFuture Series. As of last month, more than 4,900 adult learners have enrolled in these courses, which cover disciplines such as engineering and finance as well as new technologies such as artificial intelligence, he said. A year-long review has led to a refreshed National Education (NE) syllabus which will take in different perspectives, deal with contemporary issues and allow students to find out for themselves what it means to be Singaporean. Revealing this yesterday, Senior Minister of State for Education Janil Puthucheary said the review, completed last October, aimed to create a syllabus that can develop students into citizens amid changing global social, economic and political contexts. He was responding to Mr Ang Wei Neng (Jurong GRC) who had asked how the Ministry of Education (MOE) can make NE classes more interesting and relevant. Mr Ang said: "Many students cringe when they attend NE classes, which could be known as different names in different schools but have similar results. Many feel that it is propaganda." Acknowledging this, Dr Janil said: "MOE recognises that we have to be open to doing NE differently. We must empower our students to discover what being Singaporean means to them personally - not because the syllabus says so, but because they themselves know so." More than 2,000 students, educators and members of the public were engaged for their views as part of the review. Dr Janil said the recommendations from the review include nurturing a sense of belonging to the community and country, Singapore's challenges and shared hopes and aspirations as a nation. Going forward, schools will be given the autonomy to implement the changes to NE - which will be driven by three main thrusts - based on their students' needs. First, curriculum time will be set aside for more regular discussions on contemporary issues so that students can make sense of connections between the past and present, and form their own opinions after considering different views. "Our students may not agree with each other or even with their teachers," said Dr Janil. "But we do want to ensure that there is a space for respectful conversations, and that we nurture in our students open-mindedness and respect for others, and that they develop the skills for critical thinking." Second, students will be encouraged to reflect on what it means to be Singaporeans through "citizenship experiences" such as NRIC presentation ceremonies. "As educators are critical to any learning experience, the third thrust is about supporting our teachers," said Dr Janil. "We will include more professional development opportunities and involve experienced educators in spearheading innovation." Asked by Workers' Party Non-Constituency MP Leon Perera on how students are exposed to diverse perspectives, Dr Janil said: "This is already done in subjects like social studies, history and geography. Our students examine evidence and different viewpoints before arriving at informed and reasoned conclusions." Programmes which help young children learn through hands-on experience will be expanded to all primary schools by 2023. The Applied Learning Programme (ALP), already available in more than 80 primary schools and all 155 secondary schools, will play a key role in encouraging students to explore ideas, try out new skills such as basic coding and be creative, Education Minister (Schools) Ng Chee Meng said in Parliament yesterday. Emphasising the importance of cultivating the joy of learning in students, Mr Ng rubbished the idea that hands-on learning is just a "separate track for vocational students". Instead, it is an effective way of understanding concepts taught in the classroom, he added. "Students learn by applying and by doing, and they learn beyond the classroom. They see for themselves how they can apply what they have learnt to the real world," he said during the debate on his ministry's budget. "From all the interactions I have had with the students, they enjoy learning and are self-motivated. These are powerful learning experiences, and they stick for life." In his speech, Mr Ng said the Ministry of Education (MOE) will also set aside a "significant budget" to develop the new Science Centre, which will play a key role in providing applied learning experiences for students when it is completed by the mid-2020s. The centre will offer a range of programmes including hands-on maker workshops, specialised laboratory sessions and opportunities for mentorship and research. More schools will also offer applied subjects, which are examinable, such as sports science, drama and mobile robotics. There are currently seven such subjects, which give students a more hands-on approach to learning beyond the traditional academic disciplines. By next year, more than 50 schools will offer such applied subjects at the O levels, and 30 schools will offer these subjects at the Normal (Technical) level. In a speech filled with anecdotes about students and their passions, Mr Ng outlined the efforts taken by his ministry to go beyond grades and broaden students' opportunities. These include changes to the Primary School Leaving Examination scoring system, subject-based banding to allow students to take subjects they are good at, at a higher level, and exposing more children to a variety of sports. He also spoke about meeting Primary 5 pupil Aaliyah Maisarah from Teck Whye Primary School, who had worked with her friends and teachers to make a three-minute video on what fake news is and how to tackle it, as part of the school's "Media Whiz Kids" ALP. "We debated about fake news in this very chamber. Through applied learning programmes, our 10-year-old students are teaching it in their own way in school. It is a refreshing take on a very real concern," he said. "There are no tests or exams. Students learn through experimentation - they try, fail, learn from it and try again." He also called on parents to play their part in changing mindsets. "We cannot do this alone. We need the whole nation to move with us, and parents play a most important role," he said. "I strongly urge all parents to give our children time for their minds to imagine; space to experiment and learn to take risks; and the opportunity to learn from failing, trying and trying until they succeed." There was another call to remove the high-stakes Primary School Leaving Examination (PSLE) from Singapore's education system. But Education Minister (Schools) Ng Chee Meng rejected the proposal, arguing that this would only transfer the pressure on parents and students to other parts of the education system. Speaking during the debate on his ministry's budget yesterday, he also described the PSLE as a "useful checkpoint", which gives a gauge of each child's academic strengths and helps guide the child to a suitable academic programme in secondary school. Yet, the PSLE does not cast in stone what students can achieve in school and their future, added Mr Ng, who was responding to a suggestion from Ms Denise Phua (Jalan Besar GRC) of piloting no-PSLE through-train schools. Ms Phua, who chairs the Government Parliamentary Committee for Education, said hot-button issues such as high-stake exams and tuition still exist, and she has received feedback on the perceived over-emphasis on academic success. The PSLE is one "sacred cow", she said, describing it as a "structural thorn in the flesh of the system" that needs to be removed. "There are highly respected education systems globally which do not sort students at the age of 12." She went on to ask: "If we have improved in dealing with these hot buttons, why do many parents, students and educators still fret incessantly over them? "Could it be that it is insufficient to simply tweak the system through changes such as PSLE banding instead of T-scores; by allowing subject combinations instead of removing the labels of Express, Normal (Academic) and Normal (Technical) and special schools? "Are we merely rearranging the chairs on the deck and not making deep enough changes?" Meanwhile, Workers' Party MP Low Thia Khiang (Aljunied GRC) said that despite the Ministry of Education's (MOE) increasing focus on holistic education, the unhealthy obsession with academic competition is entrenched among parents, with anxiety growing in the face of globalisation and technological disruption. He urged the ministry to "not stop completing the transformation of the system despite these diehard habits". Citing a study by the Organisation for Economic Cooperation and Development which showed that anxiety among students here was higher than the OECD average, he asked if MOE could conduct its own study on primary and pre-school children. The ministry could also educate parents on the many pathways to success so they are less anxious, he suggested. Education Minister (Higher Education and Skills) Ong Ye Kung said parents can help children learn, by taking a step back sometimes. "Perhaps one of the best things we as parents can do for our children is to know when to let go, and what to let go of," he said. "By ensuring that they are so well-taken care of, does it help them or are we inadvertently blunting their abilities to adapt?" Recounting how he taught his daughter to cycle, he said: "I learnt that a young girl cannot learn how to balance with an overly-protective dad holding the back of the bike. I had to let go. "Eventually, when my running could not keep up with her peddling, I did, and off she goes. "She learnt how to cycle, I learnt how to let go." The scourge of terrorism looming over Singapore is the leading force pushing the country to budget 11 per cent more than last year to secure its home front. The increase, which will swell the purse of the Home Affairs Ministry to $6.48 billion in financial year 2018, is vital, Home Affairs Minister K. Shanmugam said yesterday. The reason is that the threat from the Islamic State in Iraq and Syria (ISIS) extremist group will grow in the region following its defeat in the Middle East. As its fighters return to the region, the ministry "must do all it can to protect our people", he said during the debate on his ministry's budget. "It is our responsibility and accountability to deal with terrorist threats in Singapore," he added. The need to invest more in the light of this menace was also underlined by Finance Minister Heng Swee Keat in the Budget Statement he unveiled last week. The threat is at the highest level in recent years, Mr Heng said. Its significance is reflected as well in the nod given to the increase, even as Mr Heng told government agencies their annual budget growth from next year will be reined in to 0.3 per cent from 0.4 per cent of gross domestic product. To battle the terror threat as well as crime, the ministry will triple its annual investments in high-tech solutions in the next two years, said Second Minister for Home Affairs Josephine Teo. While terrorism occupied a large part of the speeches of both political leaders, the drug menace was a major concern too. They said the immediate focus in the fight against drugs is on measures to protect victims and rehabilitate offenders. As for the battle against terrorists, Mr Shanmugam said his ministry will play the lead role, with the police as the "first and main responders" in a terror attack. This position is spelt out in Singapore's legal and constitutional frameworks, which state that the ministry is responsible for internal security, including managing the crisis and its aftermath. In the event of a large-scale attack, the Singapore Armed Forces (SAF) can be brought in to support the police as an auxiliary force, tapping its specialised units like the Special Operations Task Force. "To this end, the police and SAF have developed joint plans and conducted joint exercises," he said. The ministry may also get other government agencies and ministries, such as the Health Ministry and the Communications and Information Ministry, to support its operations, he added. Joint exercises will be held, and these are necessary for all parties to sharpen their response plans, said Mr Shanmugam. Mrs Teo said that Singapore must also guard against social fault lines to make it harder for terrorists to carry out attacks, and "to think twice before they target us". As a precautionary move, the Government introduced the Public Order and Safety (Special Powers) Bill this week to give the police powers to, among other things, issue an order to stop people, including the media, from communicating information that can compromise police operations. The new Act adds to the arsenal against terrorism, which was reinforced last year when the Infrastructure Protection Act was introduced and changes made to the Public Order Act. In addition, Mrs Teo said, "every Singaporean has a role to play, and that is why community partnership is a key part of the Home Team's work and also why we launched the SGSecure movement". Shortly after it was reported that a Singaporean woman was detained for radicalism last June, an Indian man scolded a Muslim woman on a bus, singling her out as she was donning a tudung. He told her that Muslims "should stay in Iraq as they did not know the value (of) staying in Singapore". Home Affairs Minister K. Shanmugam told this story during the debate on his ministry's budget on Friday (March 2) to emphasise that Singapore is not immune to Islamophobia, though noting that "so far, these incidents have been few and far between". Mr Shanmugam, who is also the Law Minister, added: "Singapore must not allow the threat of terrorism to breed fear, suspicion and distrust of each other." MHA has been contacted for more information about Islamophobia cases. Besides Islamophobia, Mr Shanmugam highlighted the need to prevent religious extremism and segregationist teachings from taking root here. Citing the banning of four foreign preachers - two Muslims and two Christians - from entering Singapore last year, Mr Shanmugam said preachers who espoused "violence, or spread ill-will towards other religions whether in Singapore or elsewhere" will not be allowed to speak here. Mr Shanmugam also addressed criticism that the Government "overreacted" in banning the Muslim preachers, Mr Ismail Menk and Mr Haslin Baharim, last October. He said Mr Ismail Menk's teachings, in particular, were divisive, and the decision to ban them were "carefully considered". Said Mr Shanmugam: "We must preserve the harmony we have and to do this, we must not let extremist or segregationist teachings infiltrate our communities. Even a small number of persons propagating radical, or segregationist beliefs can be dangerous." He said the inflammatory and viral potential of such messages is increased with social media, a point also raised by Mr Chong Kee Hiong (Bishan-Toa Payoh GRC). "It is challenging, but we work closely with community groups and religious organisations to better inoculate our community from such influences," he said. A country better known for wine and footballer Cristiano Ronaldo came in for discussion in Parliament yesterday, when Home Affairs Minister K. Shanmugam reiterated Singapore's tough stance on drugs. Portugal's softer approach on drugs - it decriminalised drugs in 2001 - has attracted attention globally after this led to a fall in HIV and hepatitis infections. But Mr Shanmugam stressed that such an approach is not for Singapore, which adopts a harsh stance on drugs, including the use of the death penalty for convicted drug traffickers. "Our approach has been effective and works very well for us. We are one of the few countries where the drug situation has been under control, perhaps the country that has been most effective in dealing with the problem," he said during the debate on his ministry's budget. He noted that currently, the number of opiate abusers in Singapore is fewer than 30 per 100,000 people, compared with 600 in the United States and some 500 in Portugal. Various MPs, including Mr Baey Yam Keng (Tampines GRC) and Mr Edwin Tong (Marine Parade GRC), had raised concerns about how young people in Singapore are adopting slightly more open attitudes towards drugs, especially cannabis. Last year, a group in Singapore called Students For Liberty cited Portugal as an example of a place where a softer approach on drugs had worked. It said it disagreed that heavy-handed drug prohibition and the death penalty were the best approach to handling the problem. But Mr Shanmugam noted that Portugal was having a serious public health problem on its hands, with many heroin abusers sharing contaminated needles and spreading diseases, when it decided to decriminalise drugs. Singapore was fortunately not in such a situation, he said. In any case, it is not all rosy in Portugal, said Mr Shanmugam. For example, the lifetime prevalence of drug use in the country has increased since decriminalisation. Surveys also showed that more Portuguese students are trying drugs, and the number of drug-related deaths has gone up since 2011. Mr Shanmugam, who is also Law Minister, said activists campaigning for a softer drug policy "light candles for traffickers" but forget about the victims of drugs. He cited as examples children who have been abused by caregivers who are drug addicts. Children, even babies, here have been shoved against walls or dangled out of windows because their caregivers gave in to their addictions, Mr Shanmugam noted. "Our penalties are severe because we want to deter such offences, not because we take any joy in enforcing them," he said. Another reason for tough laws is the regional drug situation, he said. "Our region is home to the Golden Triangle, the largest methamphetamine market," said Mr Shanmugam, noting that the trafficking of heroin and meth in this region is estimated to generate more than US$32 billion (S$42 billion) a year. "Being a major transport and commercial hub makes us susceptible both as a transit point and import market," he said. "It's beyond our ability to change factors outside of Singapore. What we can do is try and deter criminals from attempting to bring drugs into Singapore." Staff from voluntary welfare organisations will help to assess if offenders need help, such as financial aid or counselling, under a new initiative to tackle the deeper causes of crime. These Cares officers - as they are known - will be stationed at each of the six police divisions here. When they come across an offender who needs help, they can refer them to a suitable agency for help and follow-up. The Home Team Community Assistance and Referral Scheme, or HT Cares, was announced by Minister for Home Affairs and Law K. Shanmugam yesterday in Parliament. "Often when dealing with individuals who have committed offences, our officers become aware of the other problems and the complex circumstances surrounding them," he said. He said some may have health issues. Some struggle to make ends meet, while others have problems with their families. While investigators tackle the "crime-solving", Cares officers will look into the social interventions needed to address underlying problems that lead to crime, be it counselling, mental health aid or financial aid, the minister said. He said the Ministry of Home Affairs (MHA) is studying the initiative with the Ministry of Social and Family Development and will pilot it at a police division this year. MHA is also expanding the Appropriate Adults (AA) Scheme, in which trained volunteers accompany suspects during police interviews to provide support. The scheme was started in 2013 for persons with intellectual disabilities or mental health problems. It was expanded to cover suspects under age 16 last year after Benjamin Lim, 14, was found dead in 2016 at the foot of the block where he lived after being questioned by the police over an alleged molestation case. From next month, the AA scheme for young suspects will be extended to more police and Central Narcotics Bureau units, and also include Customs and the Corrupt Practices Investigation Bureau. Last year, volunteers supported about 700 interviews during the course of investigations. Yesterday, Mr Amrin Amin, Parliamentary Secretary for Home Affairs, also announced more help to enhance the employability of former offenders, including extended support from a job coach and the use of a jobs profiling tool. Substantial investments by past governments in building up the Singapore Armed Forces (SAF) will allow Singapore to keep its defence spending steady, even as countries in the region are spending more and against wide-ranging security threats, Defence Minister Ng Eng Hen said in Parliament yesterday. He said there is a need to prioritise and optimise resources, such as investing in new technologies to overcome Singapore's constraints. Dr Ng said MINDEF should maintain a spending that keeps pace with inflation - of around 3 per cent to 4 per cent each year. Defence spending rose from about $14.2 billion in FY2017 to a budgeted $14.76 billion for FY2018, an increase of 3.9 per cent. 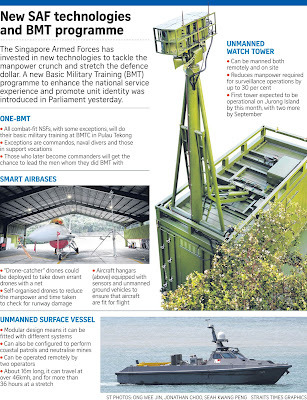 "Even for the next decade, MINDEF does not foresee any spike in defence spending. Obviously, this will not apply if there are exigencies or unexpected scenarios," he said during the debate on his ministry's budget. He said that in the last decade, other ASEAN countries have been spending more to modernise their defence capabilities, with Singapore's defence spending keeping pace with ASEAN's until about 2006. "The gap between Singapore's spending compared to the rest of ASEAN has increased, but Singapore need not increase its defence spending radically now to play catch-up," he added. This is because decades of commitment from previous generations in both financial resources and support for national service and the SAF have resulted in a strong SAF today, Dr Ng said. This is despite the fact that defence spending as a percentage of government expenditure has dropped "substantially" in the last decade to around 19 per cent last year, from a high of nearly a third in the mid-2000s. He pointed to two lessons learnt from Singapore's experience, as well as that of "negative examples" from other countries. He said: "First, the best time to prepare for trouble is during peace. Second, in the long run, steady investments into military capabilities maintain peace through deterrence and result in more effective outcomes." In Germany, due to 25 years of cuts to the defence budget, its military is underfunded and fewer than half of its submarines and planes are operationally ready, according to its government's own assessment, Dr Ng said. In terms of cyber attacks, he said, senior MINDEF and SAF leaders have been deliberately targeted by "spear-phishing" attempts - innocent-looking e-mails containing malicious software - conducted by freelancers, as well as organised state and non-state actors. "They have not succeeded, but they will keep trying." He agreed with the view of Dr Teo Ho Pin (Bukit Panjang) on the need to harness new technologies to overcome Singapore's constraints. He cited the army's unmanned surveillance towers, the navy's unmanned vessels for patrols and underwater surveys, and the air force's drones to perform runway damage assessments. The Singapore Armed Forces (SAF) will be sending more troops to Iraq later this year as part of international efforts to deal with terrorism at its source. At home, the SAF's Homeland Security Training Centre and the Singapore Police Force's Frontline Policing Training Centre will conduct routine joint training sessions to arm soldiers with the skills to carry out homeland security operations. These joint SAF-police training sessions are where SAF troops and police officers will practise operating together through a series of training scenarios. The sessions, aimed at enhancing inter-operability, will be the first routine training between the security forces when they start from early this year. Defence Minister Ng Eng Hen announced these moves to deal with the terror threat yesterday in a speech during the debate on his ministry's spending plans. He said "considerable progress" has been made since SAF troops were deployed in Iraq in 2014, adding that the coalition effort led by the United States has taken Iraq back from the control of the Islamic State in Iraq and Syria (ISIS). "Singapore will maintain our commitment to counter-terrorism globally, for our own interests." The SAF Counter-Terrorism Training Unit will be deployed to Iraq to partner the Australian Defence Force to train Iraqi Security Forces in tactical-level weapons and combat tactics. The unit will partner the British Armed Forces to train Iraqi forces in counter-improvised explosive devices. This deployment was in response to the coalition's request for combat engineer trainers and trainers with tactical weapons and combat tactics expertise to support the operational needs of the coalition in Iraq, said a Ministry of Defence statement. The team, led by an SAF officer, will comprise combat engineer trainers specialising in counter-improvised explosive devices, weapons and combat tactics trainers, and a medical team of a medical officer and a medic. Starting this year, a Community Response Module was introduced to equip all MINDEF and SAF personnel with the ability to protect themselves, and help those around them in a terror attack. Another module will train recruits to respond to a crisis or security incident even when not on duty. Almost all combat-fit full-time national servicemen (NSFs) will enlist together in the Basic Military Training Centre (BMTC) on Pulau Tekong, Second Minister for Defence Ong Ye Kung said yesterday. Previously, some NSFs did their BMT at the camps of selected combat units, in what is commonly known as the mono-intake system. The change means that, for example, a serviceman enlisted into the 3rd Battalion, Singapore Infantry Regiment (3 SIR) will no longer do his BMT where the unit is located, at Selarang Camp in Loyang. Instead, he will attend a common nine-week course on Pulau Tekong. This move is aimed at strengthening both unit identity and the common national service experience. Recruits at the BMTC selected to be part of a unit, such as those from the infantry, armour and Guards formations, will also stand a higher chance of being posted back there if they attend command school after their basic training. "These NSFs will benefit from BMTC's dedicated training experience, infrastructure and use of technology. Most importantly, they will share a common experience, within the unit, and within the SAF tribe," Mr Ong said during the debate on MINDEF's spending plans. The Straits Times understands this change exempts NSFs enlisted as commandos and naval divers, and those in support vocations. The One-BMT programme was fully implemented last November. More than 2,500 NSFs have done it since a trial began in August 2016. This change is one of a number to tackle key challenges to national service, which was the focus of Mr Ong's speech, and "remains the bedrock of the strong and credible SAF that we have today", he said. One challenge is a demographic one, due to falling cohort sizes and the shrinking enlistment pool. Another is the "evolving new unconventional security threats" such as terrorism, cyber attacks and disinformation campaigns, he added. "The future capability and effectiveness of the SAF will not be based on the number and quantity of people we have, but their quality and ability." One way to achieve this is through a review of vocation requirements, a solution enabled by technology. "So many more servicemen can now perform what could have been done by servicemen who met the most stringent physical requirements in the past," Mr Ong said. He gave the example of a serviceman operating an autonomous system in a control room being in combat, even though he is not doing something physically demanding. He revealed that since last year, the SAF has deployed more than 600 servicemen to vocations they were previously ineligible for. Another 1,500 are expected to be deployed to more vocations this year. Second Sergeant K. Dinessh Raaj, 22, is part of the first unit to have embarked on the One-BMT programme. He was given a 6 Division formation patch and physical training singlet when, on his arrival at BMTC, he was told he had been posted to the 3 SIR unit. "It drove me further to do my best in command school to return to the unit, and take care of them throughout the two-year full-time NS, and also for the 10 years (of reservist duty) after that," he said. Partnerships among small and medium-sized enterprises (SMEs) and start-ups will qualify for the integrated Pact programme from April 1, removing the existing requirement for such tie-ups to be between large organisations and SMEs. For this new Pact, the Government has allocated $100 million over the next three years, Minister for Trade and Industry (Industry) S. Iswaran said in the debate on his ministry's budget yesterday. Administered by the Economic Development Board (EDB) and Enterprise Singapore, the Pact brings together four existing schemes: EDB's and Spring Singapore's respective Partnerships for Capability Transformation schemes; Spring's Collaborative Industry Projects; and IE Singapore's Global Company Partnership Grant. It will support up to 70 per cent of qualifying costs for partnerships in capability development - including co-innovation and knowledge transfer - and business development, including business alliances and the pooling of resources. Mr Iswaran also announced other moves to help firms expand. Spring's pilot Venture Debt Programme, originally set to end this month, will be extended for another three years through March 31, 2021. The scheme lets local high-growth SMEs apply for venture loans of up to $5 million. The Market Readiness Assistance grant, which defrays the costs of exploring overseas opportunities, had its level of support raised in Budget 2015 from 50 per cent to 70 per cent. Meant to end this month, this higher level of support is now extended for two years through March 31, 2020. And to help local business leaders gain a deeper understanding of the region, the ASEAN Leadership Programme will be launched in the second half of this year by Enterprise Singapore and the Human Capital Leadership Institute. Senior Parliamentary Secretary for Trade and Industry Low Yen Ling said: "Besides the knowledge of business cultures and leadership styles in key South-east Asian markets, the ASEAN Leadership Programme will also arm participants with the chance to go in-market to learn from, as well as to network with, both private and public sector leaders." This is expected to support more than 100 Singaporeans over three years, with details to come in May. Singapore's efforts to strengthen its engagement with ASEAN were also highlighted by Minister for Trade and Industry (Trade) Lim Hng Kiang. As part of its ASEAN chairmanship this year, Singapore is pursuing an ASEAN Agreement on E-Commerce. This will streamline some e-commerce regulations across member countries, making it easier to market products and services regionally, as well as safer to send and receive electronic payments. Singapore will also work on an ASEAN Innovation Network to strengthen links between innovation ecosystems in the region. "This will further enable our companies to expand abroad, and help them to better respond to demands from the increasingly sophisticated and growing consumer base in our region," said Mr Lim. Businesses can link up for collaborations and test-bed projects via the network. An update will be given in the second half of the year. Beyond ASEAN, Singapore is aiming to strengthen its position as a trade hub with the new Trade Infrastructure Development Fund, said Senior Minister of State for Trade and Industry Koh Poh Koon. The fund, which will be implemented in the second quarter of this year, will offer grants for the development of business-to-business e-marketplaces. It will also support the creation of non-bank trade financing. Workers' Party chairman Sylvia Lim (Aljunied GRC) yesterday asked if the Government planned to increase the number of countries with which Singapore has extradition agreements. Speaking during the debate on the budget for the Ministry of Law, Ms Lim cited the case of Standard Chartered bank robbery suspect David James Roach, who fled to Thailand in July 2016, a country which has no extradition treaty with Singapore. She asked if it was acceptable that Singapore currently has extradition arrangements with only 43 out of nearly 200 countries. Responding to Ms Lim, Senior Minister of State for Finance and Law Indranee Rajah told Parliament that Singapore is open to concluding more extradition treaties and arrangements, but it was not just a matter of numbers alone. "Negotiating an extradition treaty is not without complexities," said Ms Indranee, adding that the Government would take a "careful and considered approach". The Government has to consider if an extradition arrangement would be mutually beneficial to Singapore and the other country, and whether any differences in the legal systems of both countries can be rationalised. Singapore is actively engaged in negotiations for a model ASEAN extradition treaty, she said. "We have achieved significant progress and, like many other ASEAN partners, are hopeful that work on this instrument will be concluded as soon as possible," said Ms Indranee. In her speech, Ms Indranee also revealed that the Government is reviewing means testing for qualification for legal aid. The details will be announced later this year, she said. Three Members of Parliament, Dr Tan Wu Meng (Jurong GRC), Mr Louis Ng (Nee Soon GRC) and Mr Chen Show Mao (Aljunied GRC), spoke about expanding access to legal aid. Ms Indranee noted that Singapore was the first country in South-east Asia to have a legal aid scheme in 1958. Over the past 60 years, the Legal Aid Bureau has assisted many low-income Singaporeans in civil proceedings, she said. In terms of criminal legal aid, since 2015, the Government has provided close to $6 million to the Law Society Pro Bono Services, she noted. This enabled the society's Criminal Legal Aid Scheme to help almost four times as many applicants last year, compared with before 2015. Singapore aims to be a friend to all and does not wish to be forced to choose sides, or to be caught in proxy battles, Foreign Minister Vivian Balakrishnan said yesterday. The country must preserve its ability to make independent decisions based on its national interests and not become a vassal state, he told the House during the debate on his ministry's budget. "We're not for sale, and we're not going to be easily intimidated," he added, outlining key principles that guide Singapore's foreign policy. The country also has to be successful, help promote a global order governed by the rule of law, and be a reliable, credible and consistent partner, he added. MPs sought updates on Singapore's ties with major powers and others, and its plans to strengthen ASEAN as the group's chair this year. Dr Balakrishnan said Singapore enjoys good relations with both China and the United States and hopes for a stable relationship between the two powers. "We must anticipate there will be an element of competition between the US and China, but... we hope both sides will see there's too much to lose by confrontation and conflict," he said. He pointed to tariffs the US had slapped on imported washing machines and solar panels in late January, which hit countries such as China and South Korea, as "some early signs of a trade war". Singapore, which also makes solar panels, saw "collateral damage". This illustrates the dangers of a full-blown trade war, he added. In contrast, constructive engagement between the US and China benefits both of them, the region and the rest of the world, he said. Singapore has deep cooperation with China which is multifaceted and evolving, and a major area is the Belt and Road Initiative (BRI) to spur trade, investment and infrastructure across Asia and Europe. About 85 per cent of inbound investments for BRI countries make their way to China through Singapore. Nonetheless, it is natural that issues between China and Singapore will arise "occasionally" as the two are sovereign countries with very different national circumstances. "We must expect some differences in perspectives, and not get flustered," said the minister. Singapore also has longstanding ties with the US, underpinned by close defence ties and deep trade and business links. President Donald Trump has accepted Prime Minister Lee Hsien Loong's invitation to visit Singapore later this year, he noted. Mr Trump is expected to attend the US-ASEAN and East Asia summits in November. ASEAN, the minister said, has been a cornerstone for the region's peace and prosperity, and ASEAN unity enlarges the space members have. As ASEAN chair, Singapore will work with partners to strengthen the ASEAN-led regional architecture. Above all, foreign policy needs domestic support to succeed, he said. Singaporeans must be well-informed about various viewpoints and trade-offs, and not let themselves be distracted and divided, for instance by fake news, he added. To this end, the Foreign Ministry has been reaching out to Singaporeans to explain the country's foreign policy. It also wants to develop a "national instinct against external attempts to pressure, influence or divide us", said Dr Balakrishnan. Senior Minister of State for Foreign Affairs Maliki Osman added that Singaporeans abroad must be conscious theirs is an independent, sovereign and multiracial country. "We should stand firm against external pressures and influences that undermine our national identity, interests and values," he said. Singapore's relations with its closest neighbours are of utmost importance and ties have strengthened, Foreign Minister Vivian Balakrishnan told Parliament. They are also complex and issues surface from time to time. "When they do, have a sense of perspective. Don't let a single issue derail the overall relationship," he added. The minister noted that Malaysia will soon hold its general election. "We know from past history that every time election rhetoric heats up, sometimes Singapore becomes part of the political fodder," he said during the debate on his ministry's budget yesterday. "We must ensure we do not get drawn into the domestic politics of our neighbours. Nor will we allow the import of foreign countries' politics," he added. Singapore will also not let the case over Pedra Branca before the International Court of Justice define or derail its relationship with Malaysia, said Dr Balakrishnan. "When we have a difference, we seek peaceful resolution according to international law," he said. Dr Faishal Ibrahim (Nee Soon GRC) had asked about the impact of Malaysia's election and the Pedra Branca case on Singapore-Malaysia ties. He also asked about ties with Indonesia. Dr Balakrishnan noted that when there is the right spirit of cooperation, both sides can embark on win-win initiatives. He cited the Johor Baru-Singapore Rapid Transit Link agreement and the Kuala Lumpur-Singapore High Speed Rail as examples of projects that are progressing well. These long-term strategic projects "give us all a greater stake in each other's success, and demonstrate the tangible benefits of stable and positive ties", he said. Joint ventures with Indonesia are also doing well, he added, citing the Kendal Industrial Park in Central Java, a digital industry cluster in Batam and a tech start-up ecosystem in Jakarta. Said the minister: "We believe in the 'Prosper Thy Neighbour' policy. We want Indonesia and Malaysia especially to succeed. This will be good for us, good for the region." Singapore's population is likely to be "significantly below" 6.9 million by 2030, said Mrs Josephine Teo, who is in charge of population matters in the Prime Minister's Office (PMO). The figure refers to a projection in the 2013 Population White Paper for planning purposes, which had sparked a public outcry. Given trends in foreign employment and the current immigration rate, it is unlikely this will hit the earlier projected figure, added Mrs Teo, who is also Second Minister for Home Affairs and Manpower. She also said, in the debate on the PMO's budget, that Singapore's population is expected to be below six million by 2020, as she outlined the strategies to re-invigorate the labour force in view of this trend. This was in response to concerns about demographic challenges expressed by several MPs, including Mr Gan Thiam Poh (Ang Mo Kio GRC) and Mr Henry Kwek (Nee Soon GRC). While Singapore is not expected to make major changes to its immigration policy, it has been raising productivity and looking at how to further enhance a complementary balance between the local and foreign workforce. Recent results are encouraging, said Mrs Teo. Last year's labour productivity growth was 4.5 per cent, the highest since 2010. The Manpower Ministry will provide more updates on how foreigners who come to work here can complement the existing skills of Singaporeans, she added. This builds on new schemes such as the Capability Transfer Programme, in which foreign specialists will be brought in to transfer skills to local trainees. Foreign employment grew at a much slower pace between 2013 and 2015, and even fell by 2,500 in 2016 owing to cyclical factors. She said efforts to maintain this balance between locals and foreigners in the workforce over the past years have led to good employment outcomes for Singaporeans. It has led to a growth in employment rates among those aged 25 to 64, and with real income growth at the median and 20th percentile of full-time employed citizens growing by 3.9 per cent and 4.3 per cent per annum between 2012 and last year. Maintaining immigration will stave off an even sharper decline in Singapore's working-age citizen population, said Mrs Teo. The number of Singaporeans aged 20 to 64 is projected to peak at 2.2 million around 2020 and then decline, even with immigrants. Workforce growth from this year to 2020 will also slow to about 1 to 2 per cent per year, she said. Last year, 22,076 Singapore citizenships were granted, about the same as in the past five years. The current rate of immigration allows Singapore to achieve close to the same effect as if Singaporeans had a full-replacement total fertility rate (TFR) of 2.1, said Mrs Teo. The TFR has hovered at 1.2 for the past few years. The Government will remain selective about the profile of immigrants, said Mrs Teo, because it affects how Singapore grows a strong national identity. "This is why we prioritise not only those who can contribute, but those who are also prepared to sink roots in Singapore, and can integrate well here," she added. Dr Gillian Koh of the Institute of Policy Studies said the projected figures Mrs Teo cited are not a U-turn from the 2013 figure. The 6.9 million for 2030 is at the top end of the projected range of 6.5 million to 6.9 million for 2030 cited in the paper, she noted. While people who were worried about an overcrowded Singapore may not complain, businesses may "feel discomfort" with the Government sticking to its tight and disciplined outlook on manpower growth. The personal lives of Singaporeans were examined in detail in Parliament yesterday, as MPs wrung their hands over Singapore's low birth rate. Why were people not dating, if surveys show that most young Singaporeans wanted to be married? And how can married couples be encouraged to have more babies? Some wondered why government schemes to encourage parenthood had not produced more results, and urged the Government to do more. But Minister in the Prime Minister's Office (PMO) Josephine Teo said amending laws and providing financial help addressed only one aspect of the issue. A delicate balance has to be struck between meeting the career aspirations of workers and the needs of employers as well as giving couples and families a helping hand, she said. "So what matters appears to be that more than the package of support measures, society as a whole needs to make marriage and parenthood achievable, enjoyable and celebrated. All three things have to come together," she added. The low total fertility rate (TFR) was a particular bugbear for MPs such as Mr Melvin Yong (Tanjong Pagar GRC) and Mr Gan Thiam Poh (Ang Mo Kio GRC). Mr Yong asked during the debate on the PMO's budget why the TFR remained low despite a slew of government support schemes like the baby bonus, and whether it would fall further. At 1.2, the TFR is way below the replacement level of 2.1. Mrs Teo warned against concluding that the measures to encourage parenthood were not working. The minister said Singapore's TFR had fallen below replacement levels for some 40 years, and had stabilised at the current rate for the past 15 years, noting that these same trends have played out in developed East Asian societies like Japan and South Korea. This means that financial and legislative measures alone are not enough, and at the same time, the TFR could fall without such measures, she added. She also said the children of the "baby boomer" generation who were born in the late 1980s and 1990s - a large cohort - were only about 20 to 30 years old and just entering the "peak childbearing ages". "Compared to earlier cohorts, more of them are not yet married or have not started having children. When they do... TFR could then also increase," she said. Mr Alex Yam (Marsiling-Yew Tee GRC), meanwhile, was concerned about why Singaporeans were not dating. He cited a National Population and Talent Division survey last year which showed that nearly half of the singles in Singapore have never dated seriously, despite most saying they wanted to get married. Mrs Teo said the Social Development Network has been supporting private dating agencies to come up with creative ideas to encourage dating. She quipped that the Government was open to suggestions on how it can better support this "without coming across like nannies and without being thought of as being very intrusive in people's private affairs". "The Government cannot interfere with how people go about finding a partner, or whether, and when, they start trying to have children. "These are personal decisions. But we can help those who are ready to settle down," she said. 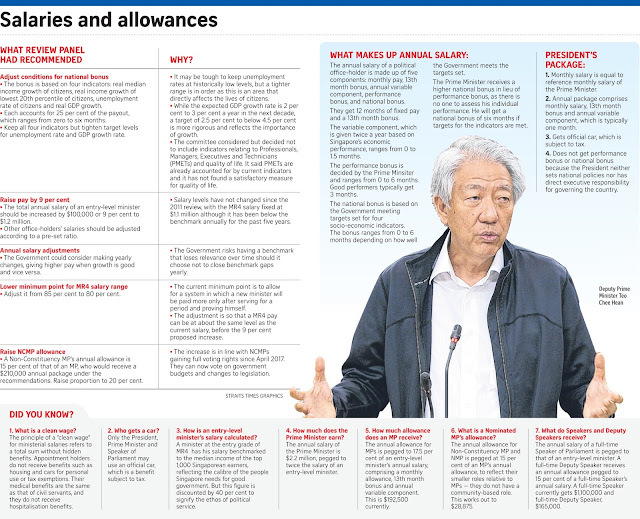 Ministerial salaries will remain unchanged and will be reviewed after five years or when it becomes necessary, Deputy Prime Minister Teo Chee Hean said yesterday. The Government has taken this decision because a scheme for determining salaries of ministers and other office holders remains valid and the economy is still in transition, he said during the debate on the Prime Minister's Office budget. Mr Liang Eng Hwa (Holland-Bukit Timah GRC), Mr Alex Yam (Marsiling-Yew Tee GRC) and Mr Vikram Nair (Sembawang GRC) had asked for an update on a review of ministerial salaries. The review was done by an independent committee formed last year and it submitted its recommendations to Prime Minister Lee Hsien Loong in December, said DPM Teo. Its recommendations include giving pay increases to politicians and various office holders whose salaries have stayed the same since 2011. The current salary framework was based on a White Paper on Salaries for a Capable and Committed Government published in 2012, which was debated in Parliament. The independent committee that made the recommendations for the paper had suggested a review after five years, and in line with this, PM Lee formed the Committee to Review Ministerial Salaries last year. DPM Teo said the 2017 committee was chaired by accountant Gerard Ee and comprised eight other members. They had recommended, among other things, that the political salaries be adjusted yearly in line with annual benchmark movements, to keep pace with market developments. The current total annual salary of an entry-level minister is benchmarked to 60 per cent of the median income of the top 1,000 Singaporean earners. The 40 per cent discount reflects the ethos of political service, to form the minister's salary. DPM Teo said the review committee found this benchmark salary for a new minister at entry "MR4" grade had gone up by 9 per cent since 2011. This works out to a compounded growth rate of 1.5 per cent per year over this period. But in these six years, the committee noted, no adjustment had been made to political salaries. As the annual salary for an "MR4" grade minister is $1.1 million, the committee's recommendation would raise it to $1.2 million. Elaborating on why the Government is not taking up the recommendation, he said that while the benchmark salary has risen in general since 2011, it was lower last year than in 2016. "Hence, the Government has decided to maintain salaries at the current level and watch salary trends further," he added. DPM Teo also explained why the Government is retaining the current salary structure, saying the review committee had found that it continued to be relevant and sound. The committee's chairman, Dr Ee, said that although the recommendations will not be implemented, he hopes enough good and capable people will continue to step forward and take up the "challenge of serving the country and doing something that goes down in history". Managing director David Leong of PeopleWorldwide Consulting, a recruitment firm, noted that ministerial pay is "particularly sensitive" and people will criticise regardless of whatever the Government does, because they deem the salaries too high to begin with. "They are not worse off vis-a-vis most Singaporeans," he said. But, he added, the Government remains on a moral high ground by choosing not to raise salaries, especially given the recent reactions to the planned increase in the goods and services tax some time between 2021 and 2025.